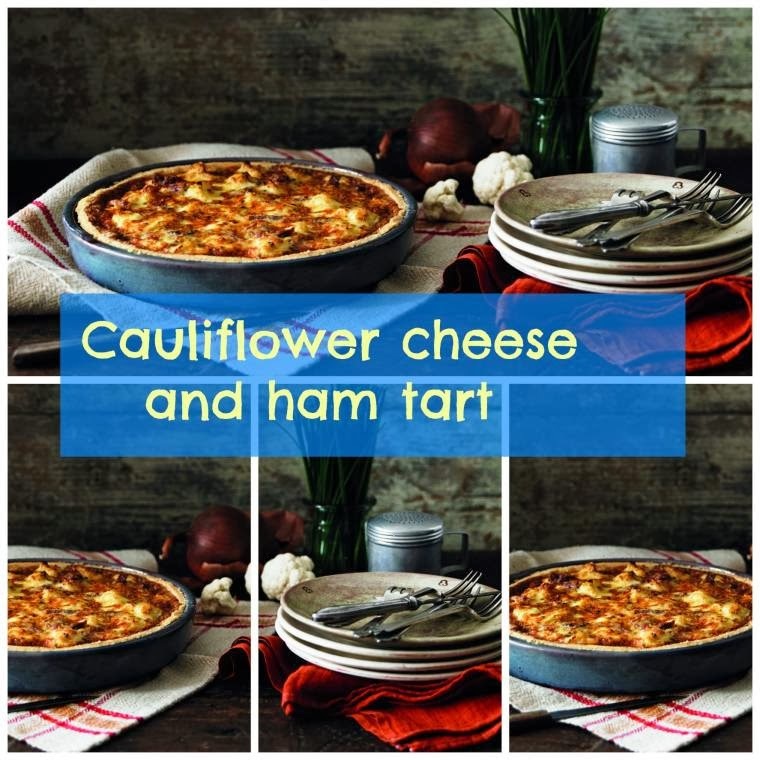 Cauliflower Cheese And Ham Tart: Party Food. Hello friends. Are you looking for some party food ideas? Cauliflower Cheese And Ham Tart anyone? Preheat to oven to 170C. On a floured surface unroll the pastry and roll out to fit a 23cm loose bottomed flan tin. Line the tin by gently pushing the pastry into the corners leaving the excess to hang over the edges. 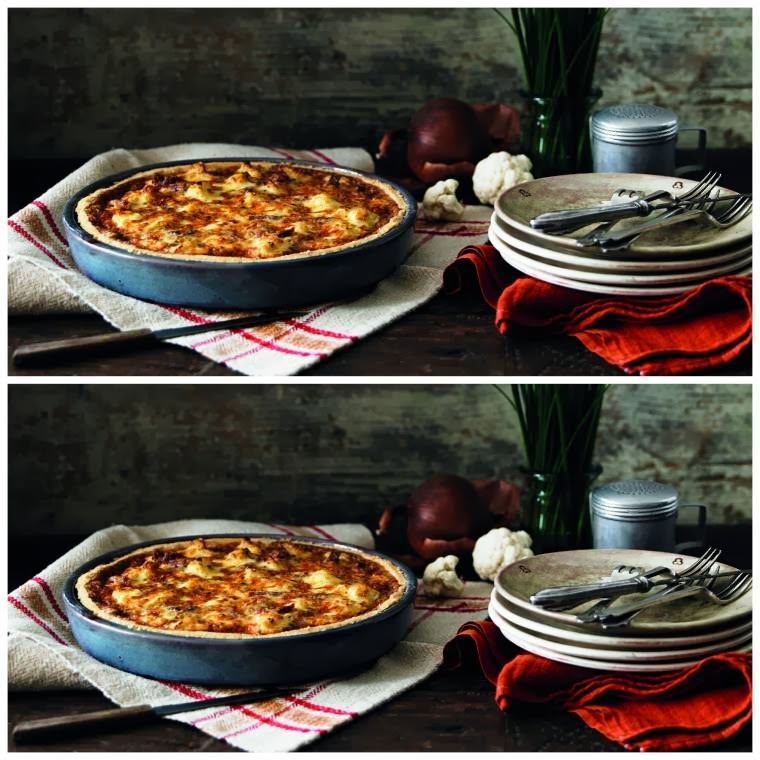 Line the pastry with greaseproof paper and weigh it down with dried beans or ceramic beans, cook for 15mins then remove the beans and greaseproof and cook for a further 8 mins or until the pastry is pale golden. In a pan of boiling water simmer the cauliflower for 5 mins until it starts to soften then drain and set aside. Gently frying the onion in Yeo Valley butter for 3-4 mins until soft. Using a knife trim the excess pastry from the edge of the case. Tip the cauliflower and ham into the pastry shell so they are fairly evenly distributed. In a bowl combine the eggs, yeo valley crème fraiche, chives and half the cheese and season to taste. Pour the egg mixture into the pastry case and top with the remaining cheese. Cook in the oven for 30 mins until the top is golden brown with just a slight wobble in the centre. * This can be a great way to use up leftover ham. "NESCAFÉ® Dolce Gusto® Mini Me Review"